Tandem master cylinders provide one of the safest ways to actuate four wheel or dual caliper axle brake systems. 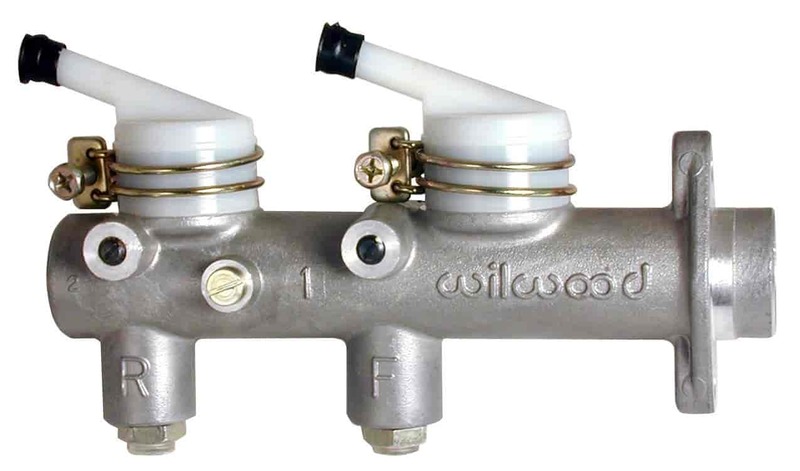 This versatile, lightweight and easily adapted master cylinder provides single pushrod activation of two separate brake fluid circuits. By completely isolating the fluid reservoirs and circuits, the front and rear brakes are able to operate independently of each other and provide a safety net should any one side of the system become inoperable. The cylinder features 50/50 output from a 1.00'' bore with your choice of 1-3/32'' or 1.10'' strokes. It is a great match for Wilwood's Bolt-On Disc Brake Kits, systems configured from OE components, and a variety of industrial applications. This pedal can be bolted directly to Wilwood's single mount pedals. The kit is complete with the master cylinder and all necessary hardware for either direct or remote mounting of the two 4 ounce fluid reservoirs. can this bolt up to a brake booster? No, this is made to be used with a non-power performance brake system.